When Matt first came to talk to me about proposing, I was thrilled! And as the conversation went on, it just got even more exciting. During a meeting at my studio, Matt and I put our heads together, trying to think of the best way to make this happen. Not only am I able to bring my perspective of a photographer, but as a woman, and Matt brought the most important part – details about Blaine and the things she loves. After hearing their story, the brainstorming seemed effortless – and the perfect plan came together. Blaine had always talked about Santa Cruz with such affection, calling it “the cutest town she had ever been to”. We also discussed her love of history, museums, that sort of thing, which is where the idea for the “historical plaque” was birthed. Matt drove all the way from Los Angeles to Santa Cruz to scout locations. He came back most excited about two places, Wagner Grove and Santa Cruz Beach Boardwalk. Wagner Grove, to fulfill Blaine’s love of nature and trees, and the famous boardwalk for FUN, of course! 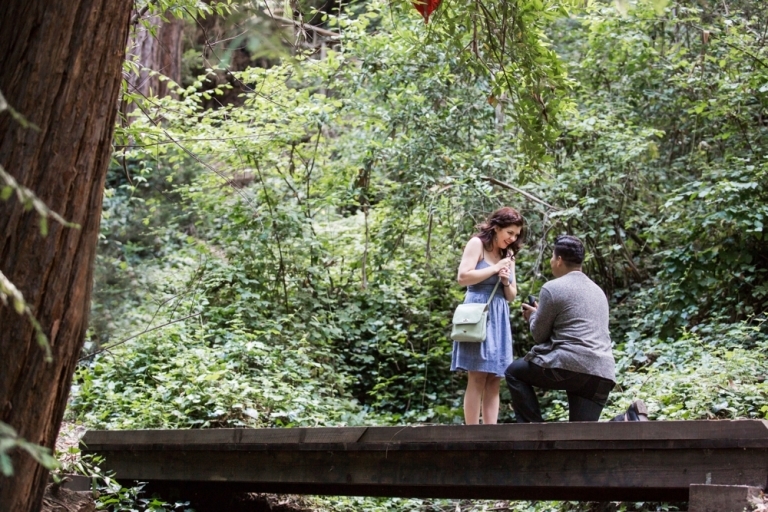 Proposals are always simultaneously nerve racking (wanting everything to go off without a hitch!) and humbling (that you get to be a part of such an important, and usually private, moment). 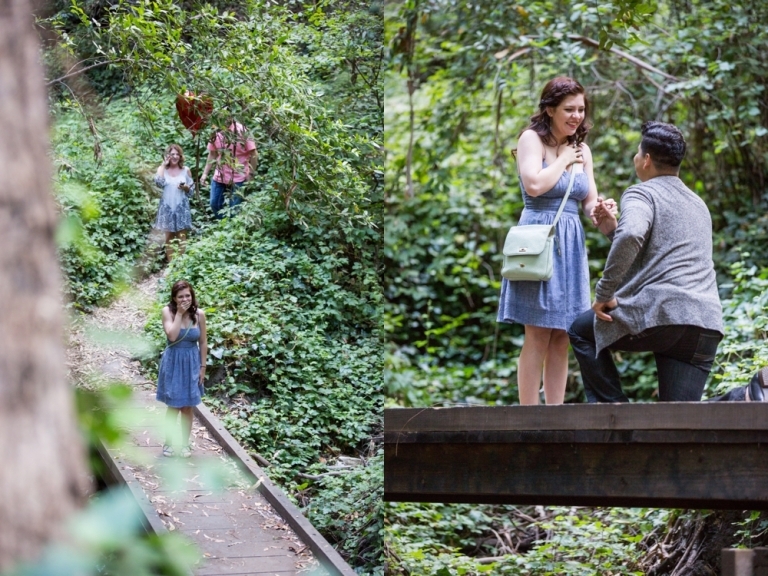 I’m not sure I have met a guy more invested in making the moment SO special for his girl… and Matt, you pulled it off and it was one of the most sweet and romantic things to witness! “Matt and I met in our college group at church. I was the new girl from Oklahoma and our friend introduced us because he was from Texas. For two years, we were just friends. We said hi, smack talked about football and that was basically it. Then one night, he showed up to church looking like a mess. He had on this shirt; it was stained, wrinkled, and missing a button that was held together by a big safety pin on the outside. He said it was his favorite shirt and didn’t mind if it was a little worn. Being the crafty and caring friend I am, I said that as his sister in Christ I couldn’t let him walk around looking like that. I offered to fix his shirt and any other worn clothes, not thinking much would come of it. A few days later, he showed up at my place with over half a dozen things needing mending. What was supposed to be just a short exchange turned into a two hour conversation! When we started talking one-on-one, we realized how much we had in common. Everything about him felt so natural, easy, and well, at home. After talking for about a week, we went to the Santa Monica Pier for our first unofficial date. I recently had jaw surgery several weeks before and was still very swollen and unable to eat solid food. Between the swelling, braces, and other contraptions in my mouth, my smile looked super weird. We went on the ferris wheel where they make you take a picture. I was insecure about my smile, but Matt just smiled weird right along with me. It was my last night in town for a while, as I was heading back to Oklahoma for the summer. So we went back to my place to make Tres Leches cake, because it was his favorite and he knew I could eat it. On June 7, 2016 my family flew into town for my college graduation. My parents and I then went on a week long adventure through Northern California. Matt said he couldn’t come because he had work. We hit the Sequoias, Yosemite, and ended the trip at Santa Cruz. The last night my mom decided we should eat someplace nice for dinner and also check out some Redwood trees since we had mostly seen Sequoias so far. The directions we got to see the trees led us to a suburban neighborhood where there was a small hidden opening of a path. As soon as you entered the path you were surrounded by a beautiful forest full of 100 ft Redwoods. A historical event happened on the wooden bridge found further along this path. 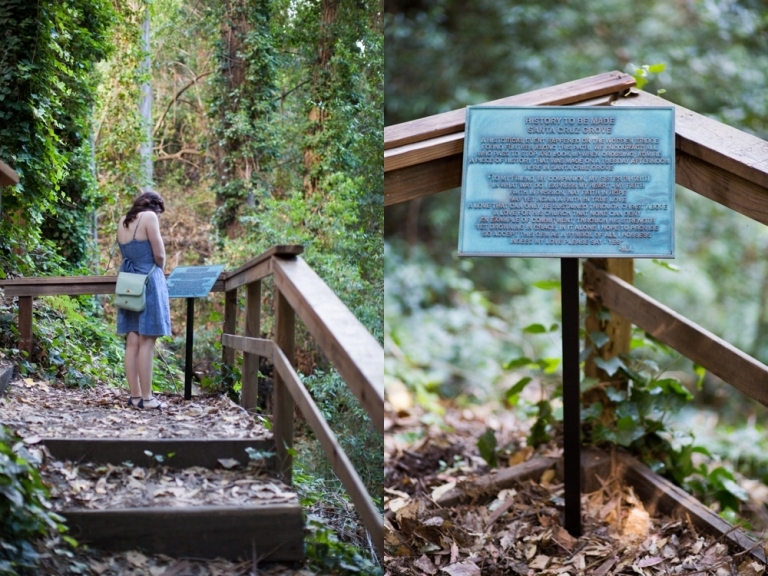 We encourage all who pass to stop and look up when crossing; admire a piece of history that was made on a Tuesday afternoon here in Santa Cruz Grove. Indeed my love please say – yes” M. J.
I looked to my mom and said, “Wow, what a way to be proposed to,” assuming the plaque was an aging remnant of past lovers. Very curious, I walked to the aforementioned bridge and looked up. When I looked up, I saw a red heart balloon hanging in the trees. I was standing there on the bridge, very confused of how an old plaque could be talking about a brand new balloon. A moment later, I saw Matt walking down the stairs on the other side to meet me on the bridge. I was overwhelmed with surprise, excitement and joy. My logical side was also confused considering he was supposedly at work hundreds of miles away. With my parents nearby, the love of my life got down on one knee and asked me to marry him. 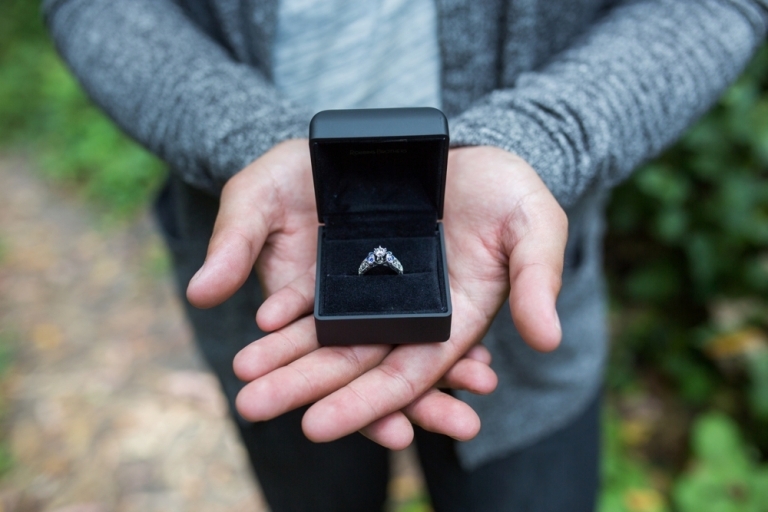 Are you thinking of proposing? I would love to talk with you more about capturing this amazing moment – just email me at meghan@meghanchristine.com for inquiries!